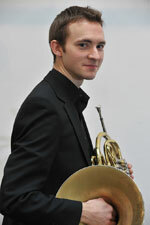 Alec Frank-Gemmill has been Principal Horn of the Scottish Chamber Orchestra since 2009. He is also a regular guest of the London Symphony Orchestra, the Chamber Orchestra of Europe and the Royal Concertgebouw Orchestra. His recording of Weber’s Concertino with the SCO received rave reviews and he now appears regularly as a soloist with the orchestra. Prizewinner of the 2011 Aeolus Wind Competition in Germany, Frank-Gemmill has also performed concertos with the Konzerthausorchester Berlin, the Düsseldorfer Symphoniker, Sinfonietta Köln and the Swedish Chamber Orchestra. As a chamber musician, Frank-Gemmill has performed at festivals in Scotland, Norway, Germany, France and Estonia. Highlights include playing the Brahms Trio and Mozart Quintet K. 407 at Wigmore Hall, as well as the Mozart and Beethoven Quintets for piano and winds with Kristian Bezuidenhout on period instruments. Frank-Gemmill is Professor of Horn at the Guildhall School of Music and Drama; he is the recipient of a Borletti-Buitoni Fellowship and was named a BBC New Generation Artist in 2014.